Would you like to make one of these darling cake mixes? Now is your chance! If you are in the Boise Idaho area, let's stamp together! 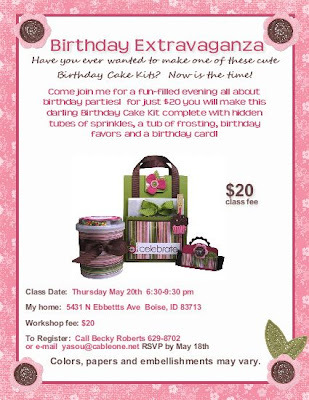 Come join me for a fun-filled evening all about birthdays! For just $20, we will make a Birthday Cake Kit complete with hidden tubes of sprinkles, a tub of frosting, birthday favors and a birthday card. Payment is required to hold your seat and no refunds will be issued if you register and do not attend. If I had the money I'd be on a plane to attend this workshop. I just LOVE everything that you create; you are a super talented artist. I wish I was closer and could attend. You Blog is my fave to follow!! I live in McCall if my schedule works out I'd love to attend I should bring my daughter that lives in Boise as well. I just need to know if all supplies are included and if we need to bring anything w/us.. I don't live anywhere near Idaho, but if you ever do a saleable tutorial, I'm buying. Is that a possibility? KellyinID--please contact me by e-mail at yasou@cableone.net. You left me no way of contacting you. Oh I wish I could come, but I live in Alabama. You are such a awesome creator and such a inspiration to me and so many others. I visit your blog every day! I'll echo a lot of the other comments, wish I lived a little closer!! KY isn't close enough for that trip! Wonderful projects! You're an inspiration! Oh sorry I just got your notice so I just emailed you back. I hope to make it and feel the 2 hr drive is so worth it for a time to enjoy crafting w/you..sure hope to make it..